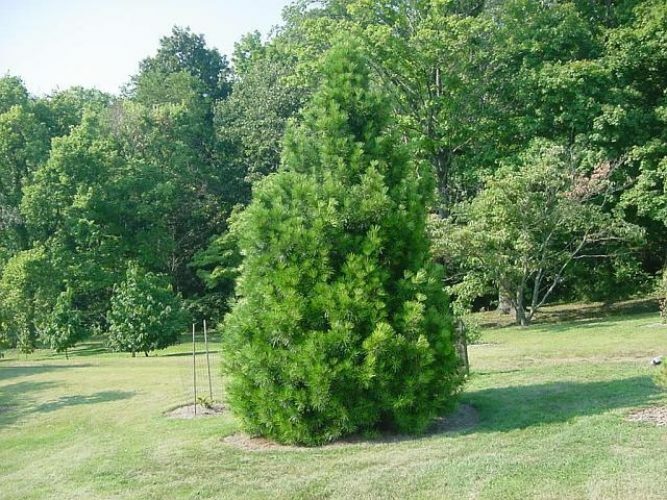 Sciadopitys verticillata, as described in 1842 by (Thunberg) Philipp Franz von Siebold (1796–1866) and Joseph Gerhard Zuccarini (1790–1848), is commonly known as Japanese umbrella-pine, as well as コウヤマキ (koya-maki) in the Japanese language. 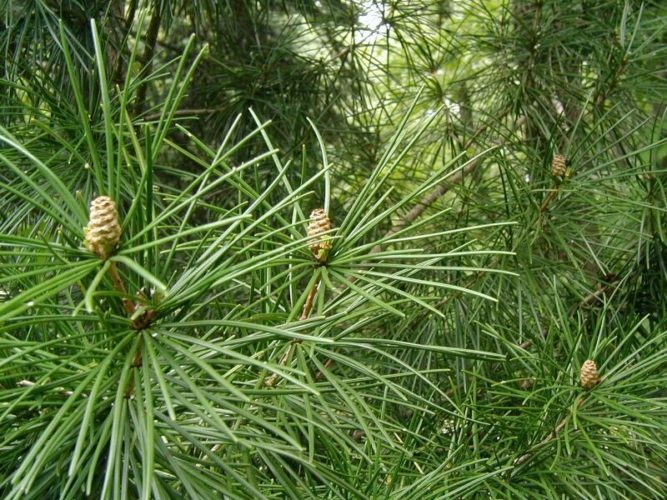 The English name 'Umbrella-pine' refers to the whorls of leaves resembling the spokes of an umbrella; the Latin Sciadopitys is a translation of this. from "Flore des serres et des jardins de l'Europe"
Description. 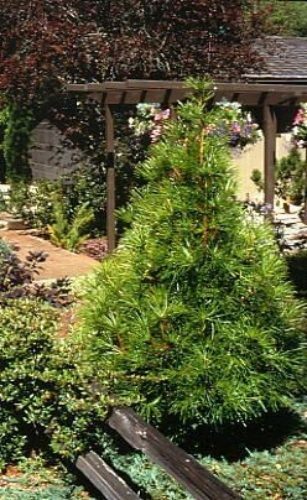 Japanese umbrella-pine is an evergreen coniferous species of tree which will grow to mature heights of 65 to 100 feet (20 - 35 m) tall with a trunk up to 3 feet (1 m) in diameter at breast height, growing single- or multi-trunked. Branching is dense and heavy with luxuriant foliage. Bark is thick, soft, red-brown and stringy. Leaves are of two types, scale leaves on the stems that are brown, 0.04 to 0.12 inch (1 - 3 mm), widely spaced between the nodes on long shoots, and clustered in a tight spiral pseudo-whorl. Photosynthetic leaves are variously interpreted as a pair of true leaves fused together, or as highly modified shoots (cladodes). They grow linearly, in pseudo-whorls of 10 to 30 at the shoot nodes and are , 2.5 to 5.5 inches (6 - 13 cm) long, 0.08 to 0.12 inch (2 - 3 mm) wide and 0.04 inch (1 mm). They are thick, heavy, fleshy, pliable, with a prominent mid-line groove on both sides; rich glossy green in color with a pale stomatal line on each side of the mid-line groove on the underside. They persist 3 to 4 years on the tree before being shed. Pollen cones measure 0.24 to 0.5 inch (6 - 12 mm) long, growing in dense terminal clusters 0.4 to 0.8 inch (1 - 2 cm) across. Seed cones are ovoid and green in color when young, ripening to dark brown 18 to 20 months after pollination. They measure 1.8 to 4 inches (4.5 - 10 cm) long and 1.4 to 2.6 inches (3.5 - 6.5 cm) wide when open. They are fragile and break up soon after seeds are released. Distribution. This species is native to Japan — southern Honshu, Kyushu and Shikoku, growing in mixed middle altitude cloud forest forests at elevations of 1,500 to 3,200 feet (500 - 1,000 m) above sea level, with high rainfall and humidity. It forms old-growth forests with Chamaecyparis obtusa. Seedlings can regenerate beneath the forest canopy, although small gaps with exposed mineral soils constitute preferred establishment sites. 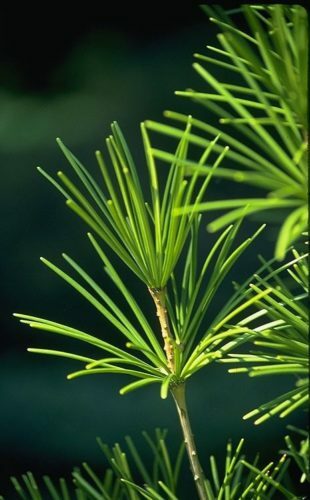 Sciadopitys verticillata — although this conifer is not a pine the close-up of foliage shows the pine-like needles of the Japanese Umbrella Pine. Sciadopitys verticillata — a large specimen. Sciadopitys verticillata — a closeup of foliage detail. 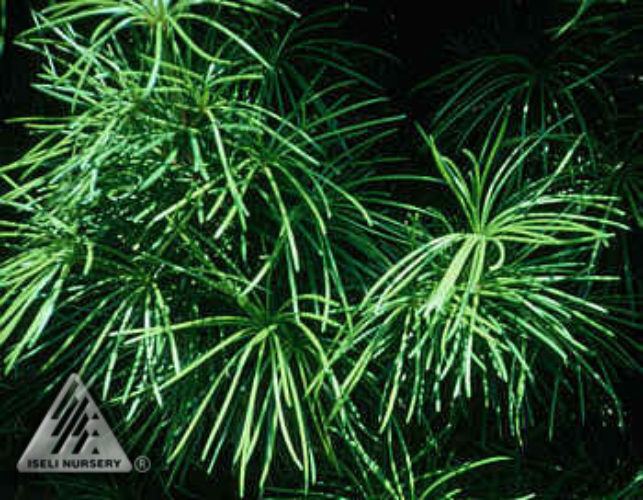 Sciadopitys verticillata — a view of foliage. Photo courtesy of Sandra McLean Cutler, author of "Dwarf & Unusual Conifers Coming of Age.